The Knicks have used their “Room” Mid-Level Exception on big man Kevin Seraphin. 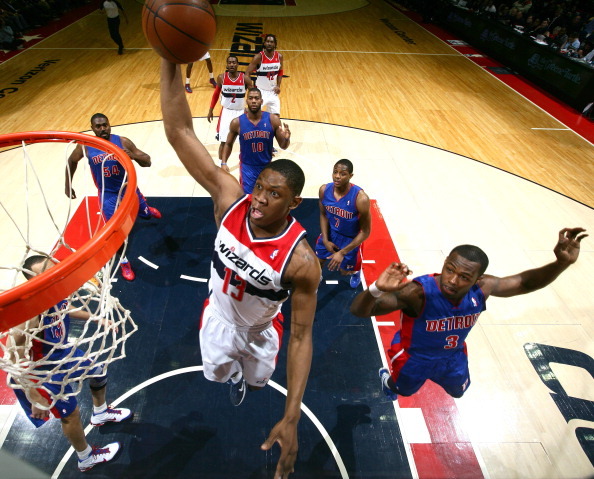 Seraphin, 25, was the 17th overall pick in the 2010 NBA Draft and spent the first five years of his career with the Wizards. The 6-foot-9, 264 lb. Seraphin plays center and power forward. Seraphin made big strides last season, and provides the Knicks with a strong, athletic post player whose excellent hook shot makes him a threat with his back to the basket and possesses a viable mid-range jumper. He has often been referred to as a “black hole” in the post, as his inability to move the ball and play within the flow of the offense has hurt his teams in the past. However, his ball movement was better last season, and if he embraces the unselfish principles of the Triangle Offense, his proficiency on the block should help him thrive without needing to force shots. On defense, the French big man has become a strong interior defender, with his huge wingspan and strength making up for his relatively short stature. Seraphin will receive $2.8 Million on his 1-year contract. The Knicks, who signed SG Sasha Vujacic last week, now have 13 guaranteed contracts and a 14th player (Langston Galloway) who will certainly make the team. They have one more roster spot up for grabs in training camp, and can only offer players the minimum salary (which varies depending on the player’s experience). Seraphin averaged 6.6 points, 3.6 rebounds, and 0.7 blocks on 51% shooting in 15.6 minutes per game last season. He shot 71% from the free throw line. This entry was posted in Articles and tagged kevin seraphin, kevin seraphin knicks, kevin seraphin knicks contract, kevin seraphin scouting report, KNICKS, KNICKS MEMES, sasha vujacic, sasha vujacic knicks, tommy rothman knicks on August 4, 2015 by Tommy Rothman.